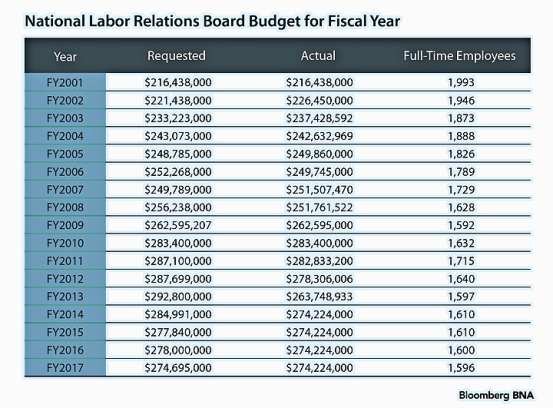 The federal labor board needs to trim its payroll and reconsider its field office system to prepare for looming budget cuts in 2019, even as Congress is still trying to pass a government spending bill for the rest of this year, the agency’s top attorney said. The NLRB has 70 to 100 more full-time employees than it was supposed to under a White House budget request that was never approved by Congress, Robb said. He also said he expects President Donald Trump to propose a steeper budget decrease for the board in 2019 than the 6 percent haircut the president requested last year. The possible hit to the board’s coffers likely means some kind of belt tightening, Robb said, especially in the NLRB’s field offices that he oversees. He added that the potentially shrinking budget, along with a steady decline in the number of cases the board processes a year, may justify some of the controversial changes he recently proposed for the regional director system. Sources have told Bloomberg Law that Robb informed regional directors in January that he is considering downgrading them from executive positions and eliminating certain field offices, among other options. Robb serves as the NLRB’s chief prosecutor for unfair labor practice cases under the National Labor Relations Act, a role independent of the board members. He also oversees NLRB field offices, which are grouped by region. Regional directors generally handle the day-to-day operations of those field offices. They have broad authority to review unfair labor practices cases and determine whether those cases move forward. Robb likened the board to “a well-aged Swiss cheese,” saying there are several openings unfilled. “I have regions that are understaffed and regions that are overstaffed,” he said. The comments come as lawmakers in Congress are still trying to hammer out a deal on a spending plan to keep the NLRB and other government agencies open for business beyond Feb. 8. Although mostly Republican members have long sought to slash the board’s funding and Trump suggested a cut last year, significant budget reductions aren’t likely to get the Democrat backing needed to pass in the Senate. NLRB Chairman Marvin Kaplan (R), who spoke after Robb made his remarks, told the group that he also expects the board to get less money next year. Member Mark Gaston Pearce (D), meanwhile, said total case numbers shouldn’t dictate how much money the board is allotted by Congress. He noted that workers don’t have the right to bring private lawsuits under federal labor law and that the board has to wait for complaints to come to it before launching any investigations or cases. “We’re talking about an agency that can’t afford to do the kind of outreach necessary in order to do the job, and an agency that’s not permitted to go out there as labor cops” investigating unfair labor practices,” Pearce said. The NLRB currently has more than 1,400 full-time workers in offices across the country, Robb said. It’s not clear whether Robb and Kaplan will look to reduce that figure through layoffs, early retirements, or other options.